City and county administrators, elected officials, economic developers, and citizens themselves. Who is not in favor of strong local economies that provide jobs at home and competition abroad? The Economic Development Agency's Office of Innovation and Entrepreneurship is once again offering its Regional Innovation Strategies (RIS) Program to help build a region's capacity to transform innovative ideas into commercially viable opportunities. 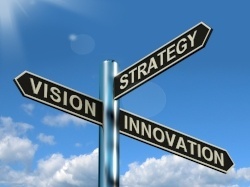 A major theme of the Regional Innovation Strategies Program is cluster-focused innovation. According to Harvard Business School professor Michael Porter, who has championed the concept, an economic cluster is a geographic concentration of interconnected companies and institutions in a particular field. A cluster contains many businesses of one certain type, their suppliers, customers, and those who advance industry knowledge, such as vocational schools, academic institutions, think tanks and trade associations. Porter believes that clusters provide advantages to the businesses within them, especially start-ups. Necessary infrastructure, a pool of highly trained employees, shared knowledge, the best suppliers and industry-friendly regulations are all more likely to be available in areas where one type of enterprise is concentrated. Even competition is a plus: Porter believes it spurs innovation and keeps everyone on their toes. All these factors synergistically converge into what he refers to as critical mass, with Silicon Valley and Hollywood being classic examples of successful clusters. The late Speaker of the House Tip O'Neill loved to repeat the phrase all politics is local; one can glean from Porter's work that all business is local as well. The RIS program is comprised of two separate competitions. Funding for this competition supports seed funds that invest regionally managed capital in promising innovation based start-ups. If you would like to read some specific examples of grantee projects, refer to our previous post Innovation Meets Entrepreneurship - The Regional Innovation Strategies Program. Eligible applicants are Native American tribes, state and local governments, academic institutions, nonprofits, the private sector, and consortia. Applications are due on or before June 23, 2017. An optional webinar will be held on Monday, May 22, at 3pm ET.